De-materialize at will, or cause you to have an experience of lost time so you think they de-materialized. Travel 300 miles a day on foot. Tell us about our past and our future. Have lived here longer than the human race. It all began with an email. A person I do not know contacted me in an email and asked me how I communicate with dolphins. He was seeking advice and suggestions because he said, "I am trying to communicate with Bigfoot and I was wondering how you communicate with dolphins." I read the email twice and wondered if the writer was joking. So I answered it cautiously. Yes, I communicate by using body language, swimming the way they swim, diving with them, and trying to match their pod behavior. It seems to work, they come very close to me. To my surprise the person wrote back with even more enthusiasm and proceeded to describe his interactions with the Sasquatch. Explaining, he is feeding them by using a box he made that requires delicate fingers to open the catch-lock on the box to get to the food. They are opening the box in a way no other animal could and so he was very excited about that. Now my curiosity was aroused and so I asked him many more questions. Soon an on-going correspondence was initiated and I learned many things about Sasquatch. I would go into their environment, remain alone and quiet, speak to them telepathically and listen for anything they wanted to give me, show me. 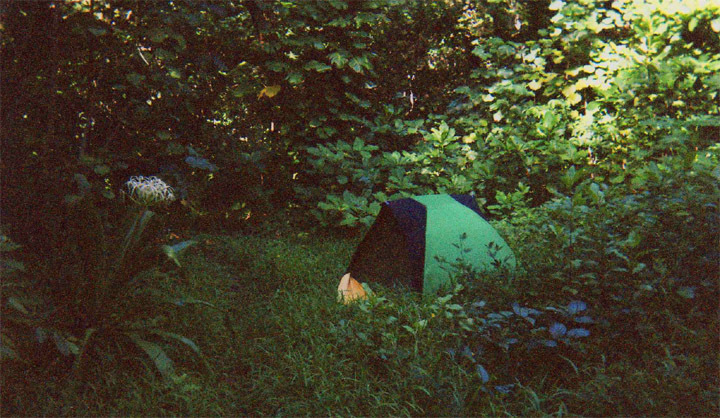 I spent a week in a one-person tent in the jungle, very naive about whom the Sasquatch really are and what to expect. 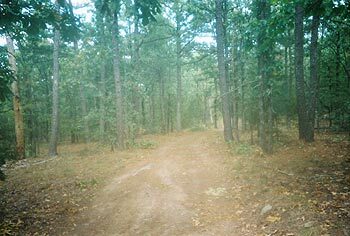 Later, upon returning home I began to read books such as Bigfoot Memoirs by Stan Johnson and learned that my experience in the jungle was filled with Sasquatch contact. Their contact is a different type of communication than human interactions. As a way of announcing their presence and also determining if I am really interested, they made strong noxious smells one night all around me. I could not determine the source of that odor - it was so strong I couldn't sleep. Naively I blamed it on something in the air from industry. (In these pristine jungles??) Or thought that someone had left an old smelly sneaker in the jungle somewhere near my tent. They created or facilitated the sound of trees falling to the ground with loud crashes. In the morning there were no trees on the ground. They made sounds like crooning birds, high-pitched, haunting and a bit spooky, in the middle of the night, while the birds themselves were quiet. And one night they touched me. In my tiny tent I was asleep, when I awoke because someone was pushing on my shoulder. Momentarily I thought I was at home where my friendly donkeys often nudge my shoulders. Then, realizing where I was, I sat up quickly and opened my tent flap to look around. No one there. All quiet. 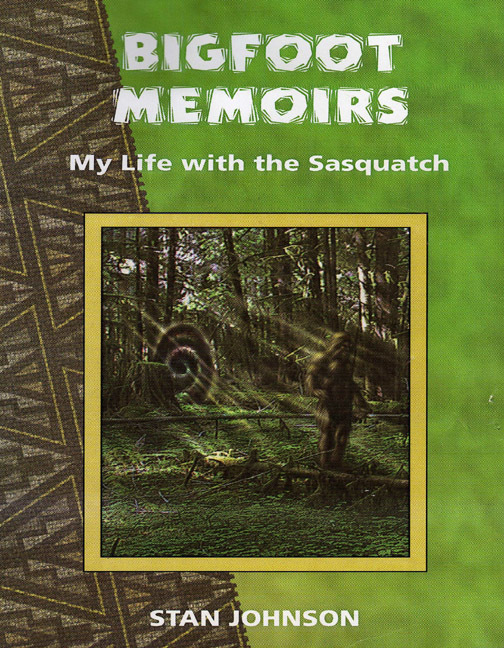 I began to learn all that I could about the Sasquatch from other people's experiences. A new friend who lives on the edge of the woods told me the Sasquatch live near her and she knows them. I sent her one of my dolphin books to give as a gift to the Sasquatch. Two weeks later, I received a gift in return. The Sasquatch had chosen a rock for me. 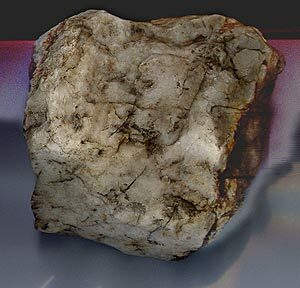 A heavy quartz rock, weighing 5 pounds with many little crystal bits within it, gleaming in the light. Along with it came a piece of crumbled paper. On it was the carefully printed words: FOR WATER WOMAN. Could this be true? I was still doubting the veracity of this. It came from the Medicine Woman of the Sasquatch family in a southeastern location of America near my friend who I will call, Susan to ensure her privacy. Apparently the great grandmothers of this Sasquatch family have had contact with white people and learned to read and write in English although they had their own language as well. This may not be true of all Sasquatch people, but it is definitely true of this clan. Having read my book, or at least receiving it, and understanding who I am, through some inner sensing abilities, they named me, Water Woman. Incredulous as it sounded, I withheld judgment until I could learn more. 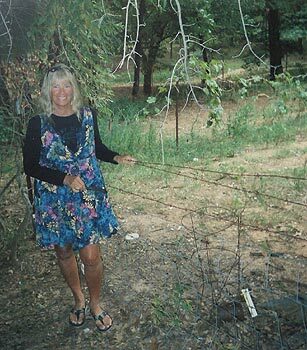 When I arrived at my friend's home, she had told the Sasquatch that Water Woman was coming. There were two more gifts to welcome me. 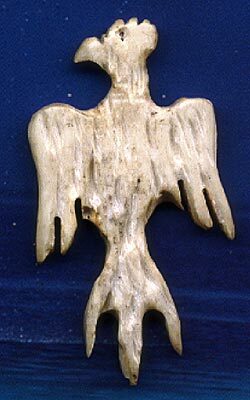 One was a small, delicately carved white bone image of a thunderbird. It was from the Sasquatch chief and he called it a Dream Bird. He said the Little People carved it for him to give to me. The other was a crystal cluster, given to me by the Medicine Woman. It is beautiful. Looking like a diamond city with crystal spires of all sizes. I was deeply moved by these kind gifts. 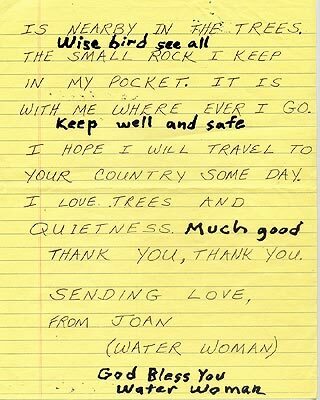 The note that accompanied them b rought tears to my eyes as I read the last line: GOD BLESS YOU WATER WOMAN. They seemed to know me although we had never met in person. I began to wonder how I could ever express my gratitude to these special people or what gift I could give them in exchange. Of course, they asked for nothing. Susan is a very kind and giving person. She had enlarged her garden to allow the harvest for all of the Sasquatch as well as her own family. 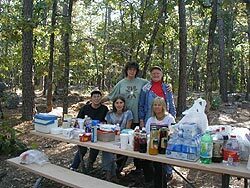 In addition, she would cook for them and bring dinners outdoors to a picnic table in the woods. She would leave it there and return to her house, allowing the Sasquatch to enjoy the food at their leisure and in privacy. She even provided large plastic bags for them to take the leftovers back to the forest. At Susan's house there were many farm animals, tame and gentle. They provided milk, eggs and companionship to Susan and her husband. Since my plan was to go camping in the woods, Susan gave me quarts of fresh goat milk to take with me for my cooler. It was delicious beyond anything you could buy in a store! The lone goat was giving milk although she was not pregnant or lactating with young. I learned that many magical things can happen out of the ordinary when Sasquatch become your friends. Some of Susan's cats had been brought there by the Sasquatch Medicine Woman who had found them and knew they needed care. The Sasquatch would leave healing herbs and roots on the kitchen table at night while the family slept. These herbs were to help any family member or animal on the farm that were sick. They were usually brewed into a tea by Susan. Some were for a poultice. On the land there were two medicine wheels. One that was made by the Sasquatch many months before, and a second one that was made the night before I arrived. Medicine Wheels are not fully understood by most people. 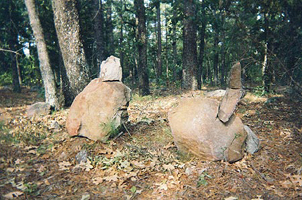 Some say, they symbolize cosmic connections and our relationship to the sun; others say it represents a symbol of Harmony and Oneness or about 'walking the Earth with reverence, with healthy minds and inner peace, honoring the connection between spirit and nature, by awakening our memories and manifesting our dreams.The Sasquatch said that these rock and shell and wood circles, describing the four directions, serve as Portals. You can go through them -- but be aware! You may not be able to come back! The Sasquatch call this other world, the Sometime Place. 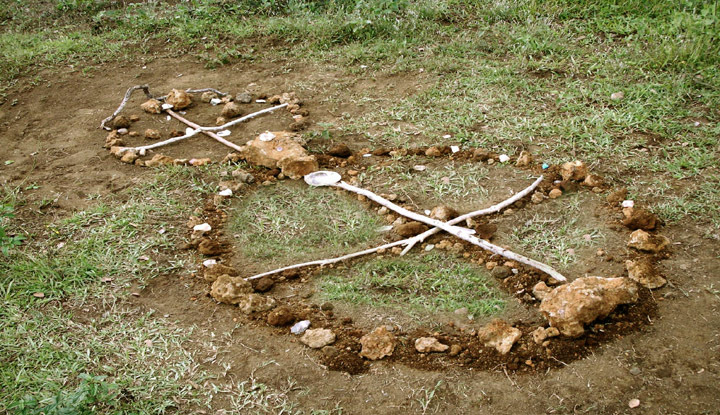 I don't know all the meanings and purposes of the Medicine Wheels, but the Sasquatch sometimes make these Medicine Wheels as a sign that they had been on the land near you. They often re-arrange them each time they come by. Since they are mostly nocturnal, these changes occur at night. Susan had come to know and love the Sasquatch family of which there were 33 including a few who are pregnant. All of their spiritual activities and understandings were new to Susan who had been raised in a southern, traditional, religious church and was often surprised by the metaphysical explanations and behaviors of the Sasquatch families. In many cases it seemed they were influenced by the Native American culture, but as time went on and I learned more about the history of Sasquatch, I began to think that the Sasquatch were most likely the Ones who influenced the Native peoples in all countries. They said that they were here before the Ice Age and they were like us at that time. 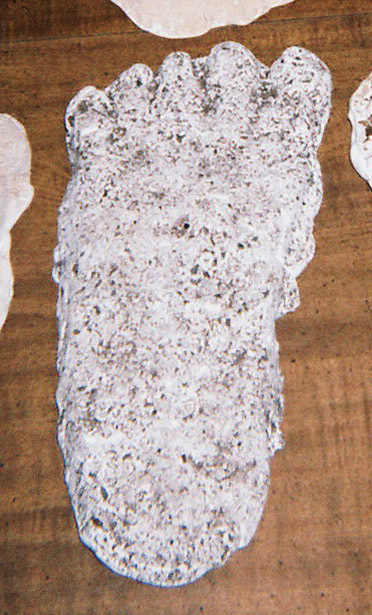 Susan and her husband also had as many as 20 to 25 molds of Sasquatch feet taken from the mud during the rainy seasons. Some even revealed toenail imprints because the foot had sunk so deeply into the mud or because they climbed an embankment and the toes dug deeply into the soil leaving an impression. 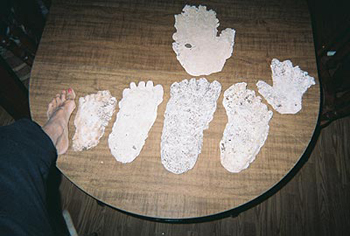 Some of the short and fat footprints were of the Sasquatch children. The Sasquatch people also give rocks as gifts. These are spirit rocks and the ones they subsequently gave me, were for communication with them and with spirit. I was to hold the rocks in my hand, ask a question of importance to me and then listen for the answer. The Sasquatch were not really interested in answering every little thought that might enter the busy mind of most humans, but they were always available to answer the heart-centered, thoughtful, requests for help from sensitive people. 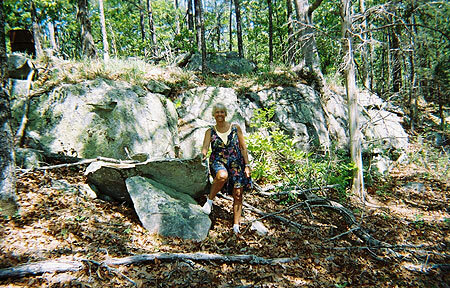 Susan and her husband have received many of these rocks. In fact they are displayed in wall-to-wall shelving for viewing and working with them privately in a little woodworking shop they recently built on the farm. 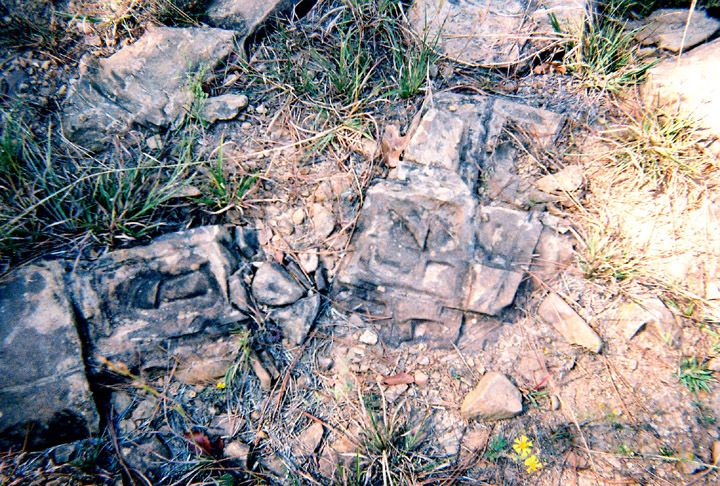 The rocks are all different; many originate from other parts of the country. They seem to call you to hold them and even communicate with them. There are also some arrowheads and carved wooden pieces. Soon I left to be alone in the forest with the Sasquatch. My friends accompanied me on the weekends and then I was alone during the week. It was ideal for me. Being in a quiet space all day to read, write and communicate with nature. 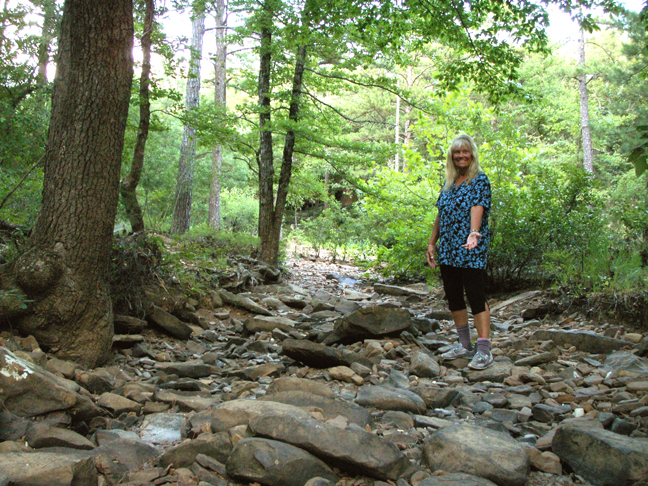 There was a little creek nearby, a short hike to water, and the general store with supplies of ice was only a half hours drive away. I am alone with the noisy crows and woodpeckers, the chattering squirrels, white-tailed deer, an occasional skunk and fox. Bears and cougars also live in these woods, but they are not aggressive and I felt secure in the presence of the Sasquatch people. From all I had read, they protect and watch over humans. 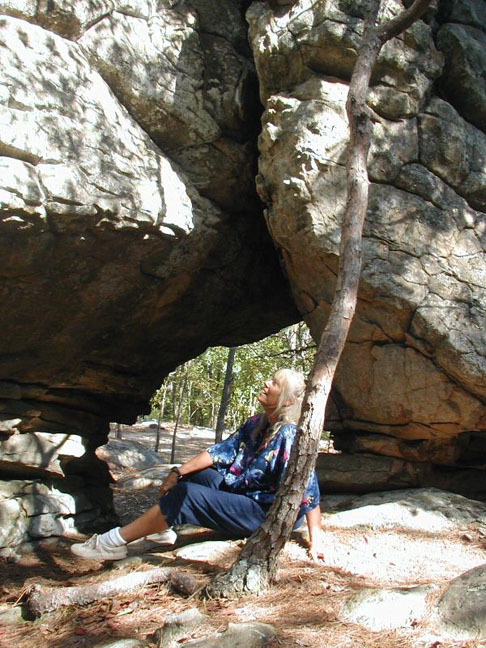 I found a comfortable white boulder to lean against while sitting on a towel on the ground, daydreaming... crackling, dry leaves of many colors are all around me. There is no furniture, no electricity and no water inside a small cabin that is my temporary home. I have a flashlight and a sleeping bag. 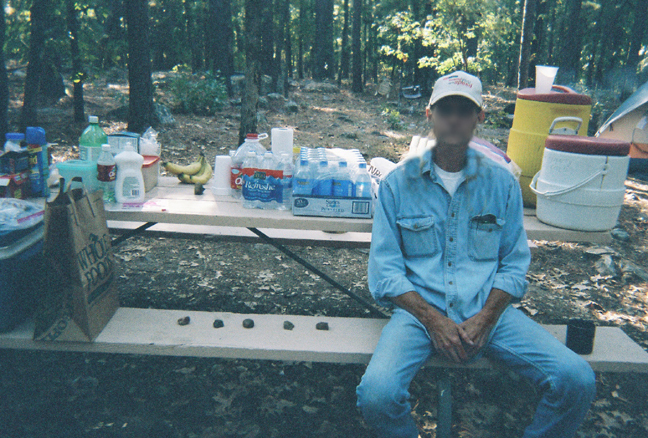 I left some food on the picnic table near the cabin as a gift to the Sasquatch. But when I returned from a hike, I saw debris all around. It appeared that the crows were the ones who benefited from the food. They were noisy in the trees caw-cawing loudly. Sasquatch have told me they can enter the spirit of the crow and see the world through their eyes while flying through the tree tops. What to think? Was it the crows or the Sasquatch who ate the organic apricots and bars of chocolate? Wednesday night and it is nearly dark at 8:00 p.m. I am outside where the full moon is shining brightly between openings in the tall pine trees. The light is beautiful and I savor the total stillness of the forest. Standing unmoving among the trees, I express out loud my appreciation for the beauty of the trees and of the night. There is a sense of timelessness in this moment. The moon looks huge and bright white. As I gaze at it, I wonder if there are U.S. or E.T. bases on the moon. Around me I begin to feel an aura of Love. It is a gentle frequency that expands a hundred feet on all sides. I recognize it as the same welcoming vibration I receive when the dolphin pods approach. Who is it? I wonder? I have the feeling someone is coming. There is something very loving in the air. Could it be the Wise Ones? This is the name for the Sasquatch people who are the most advanced spiritually and intellectually. Glancing outside the open door, I see movement at the edge of the porch. 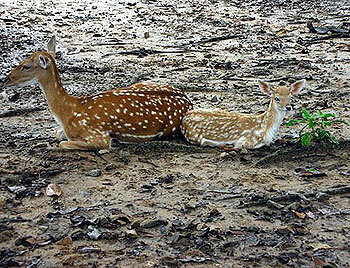 I bring my attention to the area and become aware of two gentle dark eyes looking at me. They are not staring or piercing eyes, but soft, half-closed eyes. I feel the warmth behind them. Widening my gaze, I see the rest of the head, and a form standing just beneath the porch roof. In the fading light, I can see the head is big with curly hair surrounding the face. 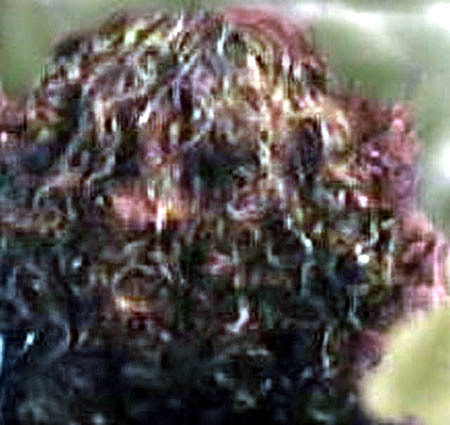 I hadn't pictured Sasquatch with curly hair. It looks very nice, like a child's favorite teddy bear, well-worn. I look steadily at the face to be sure I am seeing what I think is there. The head of this huge body is framed in the leaves from the trees. It seems to be merging with the leaves. I see a distinct curl over the right eye. There is no obvious neck, a dark outline of massive shoulders, long arms. The lower part of the body is too dark to see in detail, but it blocks out everything behind it, giving me an idea of its size. The eyes continue to stare softly at me. The head is below the height of the roof. I estimate this Sasquatch is more than six feet tall. I wonder if this is a Sasquatch or a Wise One. I have heard that the Wise Ones do not have hair on their face and that their face is a light color. That they have large shoulders but a thinner, narrow, long body. Stan Johnson described them similarly in his book. I wonder if their appearance changes with the weather, the temperature. Are they more bushy in the winter? It has been 80 degrees F. every day.... so many questions! As I look at this alert being with sparkling eyes, I feel love and gratitude. Thank you so much for coming this close and letting me see you. I am happy to meet you. Soon, too soon, the eyes look down and the Sasquatch moves silently to his/her left, out of my sight. I hear two departing footsteps, crunching in the leaves, and then nothing more. I remain lying in the cabin expressing appreciation. 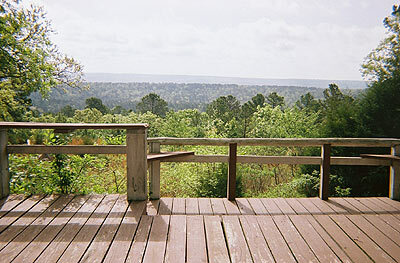 In a little while I go outside and sit on the porch. 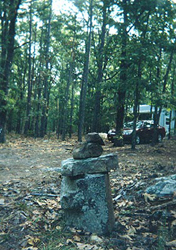 The Sasquatch welcome people with stone markers that are precariously stacked along the road and near the cabin. 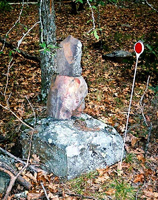 I took pictures of these stone totems admiring their skillful designs and signs of their intelligent presence. The Sasquatch were here, although unseen by most people. Now I hear a sound like two sticks being clapped together, repeatedly. I continue to look into the darkness, hoping to see my Sasquatch friend again. No movement, everything is dark. I continue to telepath to them. As I am wondering why they haven't been around that much, they point out that the severe dry weather that the forests are experiencing makes the area by the river more desirable for them. I have a vision of them swimming in the coolness of the river. It is about 20-30 miles away from this little house. They also communicate that they spend time in the coolness of their underground homes. The area is very dry right now and everyone is wishing for rain. As I sit in the quietness for another 15 - 20 minutes there is a sudden noise like heavy raindrops. It is a shower of tiny pebbles falling from the top of the nearby trees through the branches and onto the ground, in front of the porch. They do not touch me, but I can see them falling, as if from the sky. A phenomenon like that takes someone to create it. It is not a natural phenomenon. This is how the Sasquatch make contact, in a mysterious and also non-threatening way. They let me know they are nearby. I understand it as another sign of welcome from the Sasquatch. 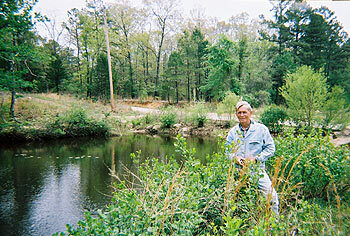 Quietly, I continue to communicate ... "Is there anything I can do to help you? To help the Earth?" Answer: "Teach as you do, about the passion and compassion you feel for all the animals, for all of life. Teach from your sensitivity about us. People will listen to you and begin to understand." I continue to stare into the darkness. There is a dim light on me from a Coleman lantern. I am looking at the ground, to the place where the pebbles harmlessly dropped. The silence is very thick. Suddenly I hear heavy footsteps in the crispy foliage, just beyond the nearby trees. Loud, heavy, approaching me, each step placed strangely far apart. My heartbeat increases and I'm sure my quickly palpitating heart is visibly shaking my body ... a moment of fear! Then I remind myself who it is - the Sasquatch People. In my mind I explain to them that in human films (movies), sounds of footsteps in the night are a cause for fear. Most people automatically react that way. Now the fear is gone as I acknowledge their presence near me. There are 3 heavy steps, the last one a shuffle. Then two more heavy steps and that is all. Where did they go? How can they walk without being heard? Do they dematerialize? I remain listening in the way the dolphins have taught me. Hearing the faintest, most minuscule sounds. All is silent. Not even a bug buzzing or a squirrel running across the ground! Time to crawl into my warm sleeping bag. There, I toss and turn all night, too excited to sleep, happily reliving what happened and remembering the face of my new friend. The next day, I drive into town and visit stores, getting more ice for the cooler. Susan and her husband are arriving today, and so I buy some food to share with them. In addition, some of their friends from the Archeological Society will come to visit. They want to hear about the dolphins. Susan and I have a nice evening, talking and getting to know each other better. She tells me more stories about her friendship with the Sasquatch. She depends on the Wise Ones for all sorts of advice about health and family issues. She also asks them questions about who they are and how they live. They write printed words to her in her notebook. 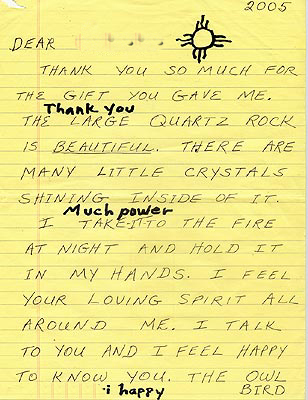 Susan and her husband have many messages written to them by different Sasquatch Wise Ones. The Wise Ones may be related to the Adena people who were tall and powerfully built, women over six feet tall and men over seven feet tall. They are described as a clan of strikingly different people of great presence and majesty. It was interesting to me to learn that the Wise Ones can erase your mind so that you forget you talked with them. They said you will not forget the information they share with you, but you will probably forget the meeting itself. You will think you have never seen them, but you have. This morning I drew a picture of the face I saw in the dark last night. I felt compelled to draw the gentleness of the eyes and the light shining in them. I did my best. The only art supplies I had were a black indelible marker and a piece of paper toweling. All I could see of the face were the eyes, and I didn't know exactly what the rest of the face looked like. I am pleased that I followed my instincts and drew this the morning after the contact while the memory lingered so clearly within me. Then later in the day, Medicine Woman came and telepathically said to Susan that she, Medicine Woman, was the one who contacted me and who I saw last night from the cabin. You can imagine how happy I felt to know that it was our friend, Medicine Woman, who was the loving Wise One who chose to reveal her presence to me. 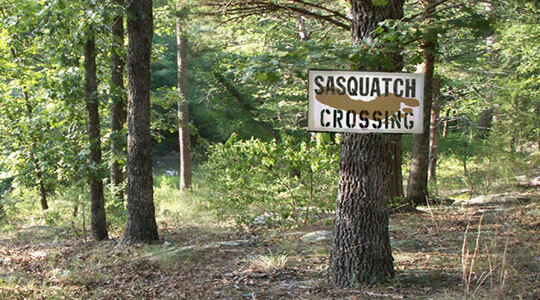 This family of Sasquatch walk long distances from one part of the country to another. It is easy for them. They can walk 10 to 20 miles an hour, depending on the pace. Fences, even those with barbed wire, do not deter them, since they can step over them. They consult with other Sasquatch for healing remedies. It seems to be of great interest to them and they know the herbs of the forest well. They will suggest the best berries and roots to use to heal your illnesses if you ask. Now Susan shows me a wall calendar that she uses to jot down her appointments and schedules, etc. She took it off the wall at hom e and brought it to the forest today. 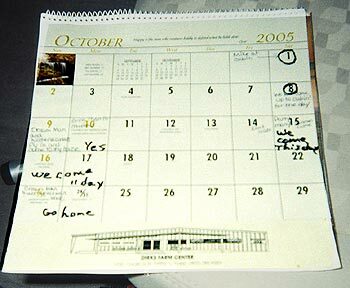 In addition to Susan's notes written on the calendar, there are also notes by the Medicine Woman. She writes when she will be at the Farm and when she will be in the forest. She has written that she will be in the forest when we are there, this weekend. She wrote: WE COME THIS DAY and the next weekend, she wrote: WE COME 11 DAY. Susan explains that the number is not number eleven, but number 2. They write numbers by using strokes, one stroke for each number. 1 represents one day. As the evening came, I began to hear soft clinking sounds as though two crystal wands are being tapped together. It is very subtle and could only be heard in concentrated listening. Once you hear it, you can tune in to it very well. It certainly was not a forest or animal sound. These are the kinds of signals they give us to let us know they are arriving. As we sat around the fire, a small heavy stone came through the trees into the fire. It was a "Hello, we are here!" sign. Not threatening, not aimed at us, but precisely thrown so we would see it fly into our midst. 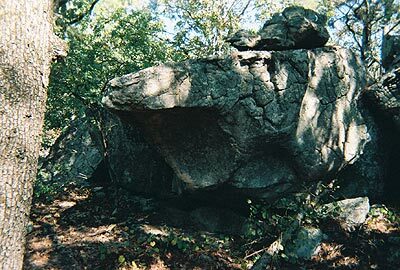 Since we cannot see any Sasquatch around at times like this, are they teleporting the rocks? I know they can teleport things because in the next few days there in the woods, they demonstrated this. Now off in the distance I hear a call that sounds like an owl imitation. "Hoo ... Hoo ... Hooooooo" This is repeated over and over and is coming from the west. Ten minutes of silence then I hear it begin again, lasting longer, only now it is in the extreme east. Could this be two Sasquatch families calling to each other? Or did one Sasquatch quickly move from one mountain to another? What they have shown me is their ability to project their voices. On this night they demonstrate this to me, until I am surrounded in a stereophonic circle of Hoots from different directions. They play with this, first watching me look to the right in response to a sound and then looking to the left because the sound is now over there. I understand the concept. Again the dolphins have demonstrated the same thing. They also can project different sounds simultaneously in each of our ears while we are swimming together. It helps me to understand the Sasquatch because of my experiences with the dolphins in the ocean where sound moves more quickly than in air. Suddenly a shrieking high C sound pierces the silence that causes me to jump in my chair! It is very close to all of us. We were all startled. A sound like that goes right through your body. There is no night bird or animal that makes that sound. It repeats again, but this time we are not startled and so we listen with interest. It is followed by silence and then the hooting sounds resume. We also listened many nights to loud sounds that seemed to be a rock being hit against a boulder - rock on rock. We also heard what sounded like a stick on a scrub board, and one night we heard sounds of extra loud growls like an injured lion. Never a dull moment! The nights were filled with mysterious noises and activities in the darkness. Sometimes it feels like we are subjects in a Sasquatch research project. Perhaps a project to determine which sounds create what reactions in humans. Or perhaps a communication project called "what does it take to make humans know we are here and we are their friends?" The next day, some people who own land nearby come for the weekend. 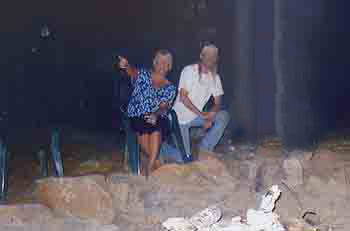 This is a couple that also has contact with the Sasquatch in this location. 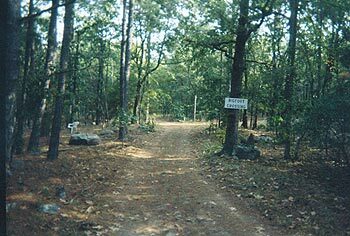 The man was a gun-toting Bigfoot hunter until he began to experience their presence and their sense of humor in the woods. Now he is their friend and he even posted No Hunting signs on his land. He has a keen sense of humor and he appreciates their playful jokes. As we sit around the fire that night, we hear the heavy footsteps in the leaves. Big-eyed we all look at each other, but say nothing. 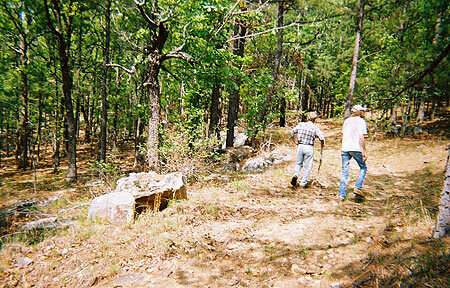 One of our group sees the Sasquatch standing upright in the woods. "He's there!" he shouts pointing into the darkness. The Sasquatch flattens himself against a tree that's behind him. "Where?" we ask. Then we see the Sasquatch turning and silently running the opposite direction! "Come back!" someone else yells. "Come see us!" But the Sasquatch keeps going with long, graceful strides. They have been known to hide items such as hats and crystals and then have them show up elsewhere, much to the confusion of the humans who own the articles. The Sasquatch seem willing to announce their presence in whatever way is possible -- except for the obvious one of making an outright appearance. Susan has said that sometimes the Wise Ones will purposely scare people, especially if the people are carrying rifles. One evening, with tremendous growls and animal sounds, they came crashing through the woods, running directly towards a group of hunters sitting around the firepit. The men stood up and prepared to run. At that moment the Sasquatch disappeared. I have experienced dolphin and whale 'disappearances' in the ocean. It is a mystery, the details of which I won't describe here. But I have given this a lot of thought and I am still not sure if indeed the dolphins and the Wise Ones can dematerialize OR if they are creating a field of energy around us that makes us unable to see something that is going on around us or temporarily gives us an experience of interrupted time. From the Wise Ones, I have learned about the unique characteristics of Infrasound. This is a sound that can affect us emotionally, mentally, physically - vibrating internal organs, and multi-dimensionally. Dolphins and whales use it along with some animals, such as giraffes, lions, elephants, and others to communicate and/or to stun or paralyze prey. 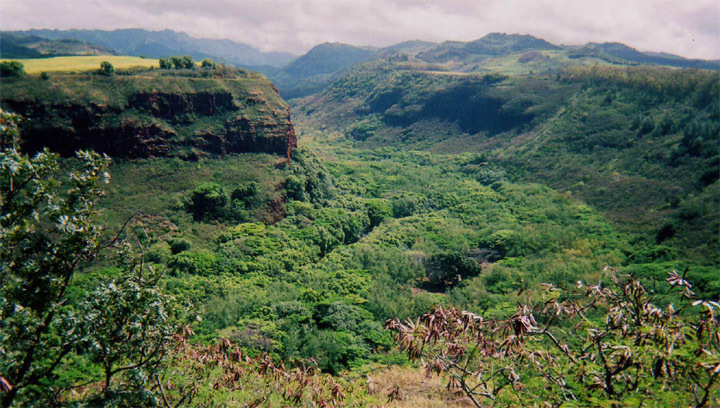 Infrasound can be used to communicate over thousands of miles. These infrasonic waves are sound waves so low in frequency that the human ear cannot detect them. Human ears detect sounds in the frequency range of about 20 to 20,000 Hertz (cycles per second.) Anything below 20 Hz is defined as infrasound, which although not heard, is experienced in the form of pure vibrations. Webster's dictionary defines infrasound as "1: having or relating to a frequency below the audibility range of the human ear. 2: utilizing or produced by infrasonic waves or vibrations." The Wise Ones have said they came from before the ice age and they are our big brothers. They said they were like us, when they lived at the time of the ice age. Which implied to me that they have now changed and are different than us. Humans in the year 2005 are like the Sasquatch during the ice age. Could it be that the Sasquatch of today have evolved many skills that confound us? In this evolution, they seem to have learned about Infrasound emissions. The Sasquatch are able to create sounds so low, we cannot hear them. However our body and our senses do experience them. Apparently the Sasquatch can use sound to effect the environment. 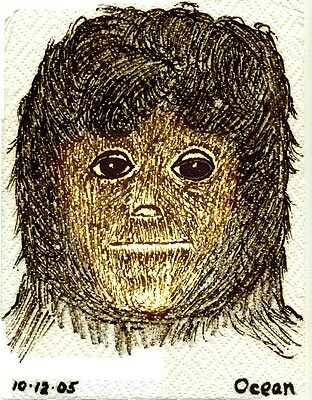 There are thousands of reports of Sasquatch contact where the wooded areas are suddenly inundated with odors so atrocious that people retreat with a burning sensation in their nostrils. They also are able to create a field of unnamed fear around humans that makes people leave in a hurry, and also creates so much fear that the people are reluctant to ever return to that location again. Not much amplitude is needed to produce negative effects in the human body and mind, and even mild infrasound exposure requires several hours, or even days, to reverse symptoms. These are examples of Biological infrasound. In my personal contact with the Sasquatch people, I have never experienced these extreme and fear-promoting protective fields they emit. That leads me to believe they have control over their emissions and generate them at will. 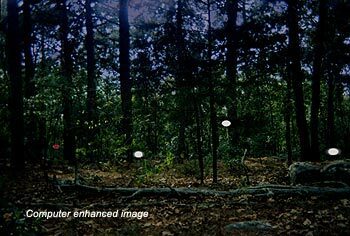 The research supports the facts that the infrasound waves used as a non-violent protection are often generated in the presence of rifle-carrying Bigfoot hunters. 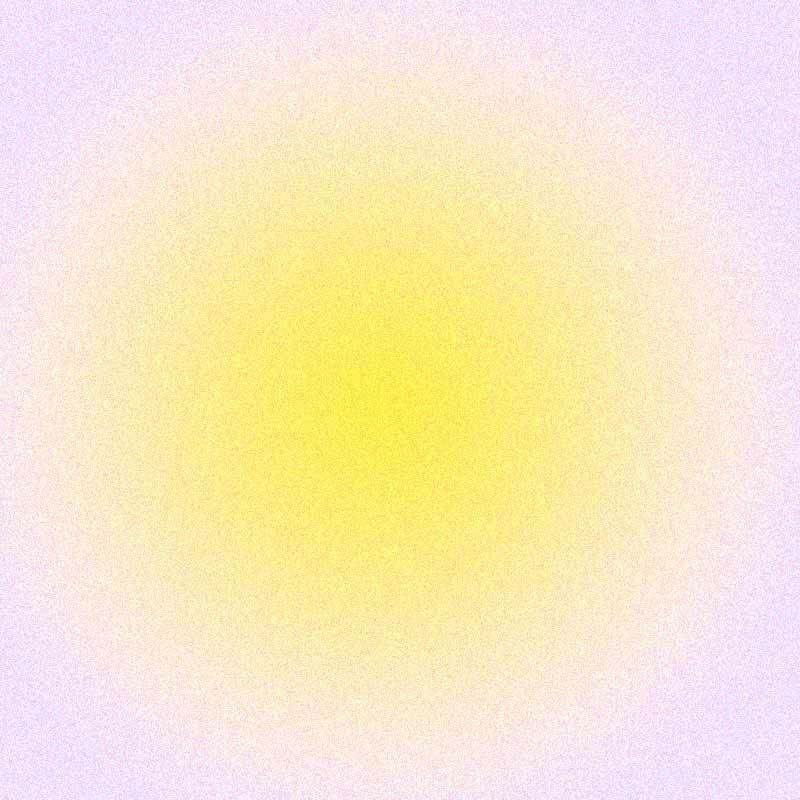 Infrasounds are also effectively used to create fields of calm and peacefulness. I feel that I have been in the presence of these types of soundwaves that are creating environments of harmony, and eliciting emotions of well-being. This also can be experienced while swimming among dolphin and whale families who are creating infrasound harmony, when they accept you into their pod. Infrasound is still a relatively new science --- especially Infrasound that is of Biological origin. Non-biological sources of infrasound abound, including thunder, air turbulence, volcanoes, earthquakes, jet engines, waves and ships in the ocean to name a few. Infrasound waves hug the ground, travel for long distances without losing strength, and are unstoppable. There are presently Hydroacoustic Stations around the world detecting low frequency sound waves, including the dangerous Low Frequency Active Sonar deployed by the U.S. Navy in international waters. I feel that the Wise Ones are experts at emitting the frequencies of Love into an area and helping people to remain calm where they could possibly panic. Some stories have been told of Sasquatch offering help to people in distress (cars caught in mud, children are lost, animals are injured, etc) At times like this the Sasquatch/Wise Ones often need to reveal themselves in a physical way in order to assist. I believe they use their infrasound to help people relax before they make their presence known and begin to assist as needed. Over the weekend, while people from the Archeological Society were with me, I was given my next test regarding expanding-my-reality. 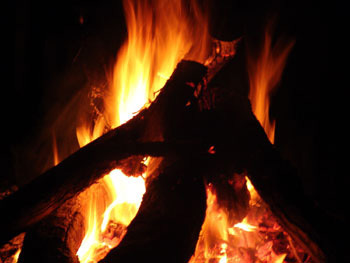 In the evening we sat around the fire and again experienced the "Hello" of the Sasquatch as we witnessed 3 or 4 large stones thrown into the fire from above us. In addition, some stones seemed to be thrown from behind us and flew past us where we sat. These objects were projected past us with great speed and great skill. None of them ever touched us or hurt us, and yet they were close to us. 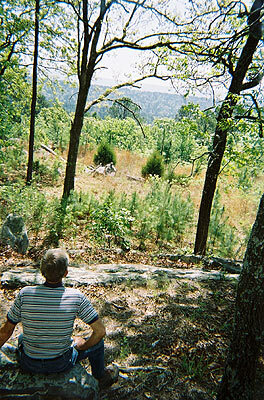 At these times we did not see any Sasquatch, nor did we hear any movement. It was as if the stones appeared and were projected out of the air. Observing this repeatedly, made me feel they can indeed, manifest objects and control them from a distance. I don't think they were throwing things at us. I think they were demonstrating their skill at teleporting objects. And they were teaching us about it, by example. As the night went on, most people retired to their tents. I was alone with one person at the fire. As usual, I preferred to be quiet and to listen to any sounds that were around us. We could hear the fire crackling and a slight wind blowing in the trees. 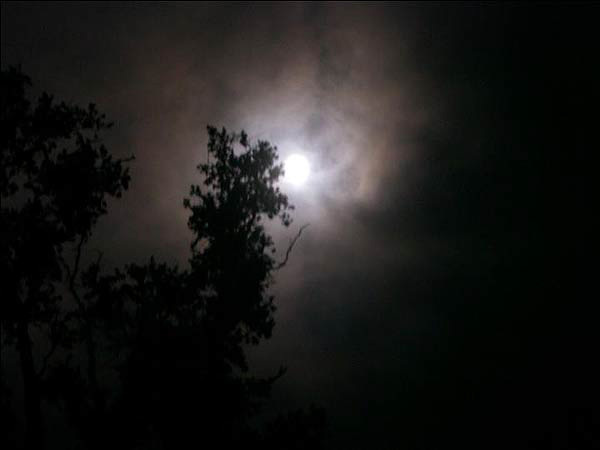 It was a dark night, the clouds obscuring the moon. 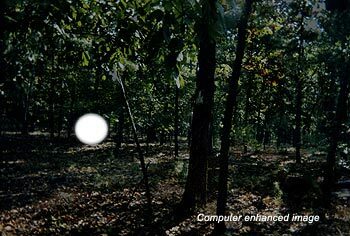 All I once I saw a globe of white light floating near me in the woods. It looked like a flashlight, but it had no beam shining out of it. It was a self-contained, egg-shaped light about 3 inches across. It was moving at about 3 feet off the ground and seemed to be free-floating but with direction, i.e. 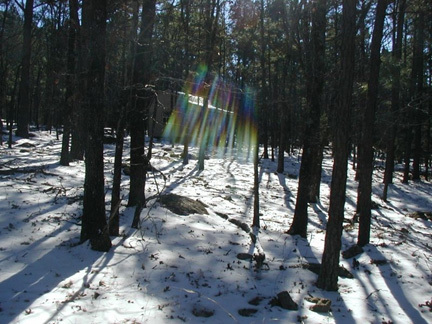 I could not see anyone holding the light or standing near it, but the light continued to move through the trees. Then I saw a second one. My friend, Mike, sitting at the fire saw them as well. He noticed another one in the trees about 150 feet from us, across the road. We continued to observe them as they moved around. 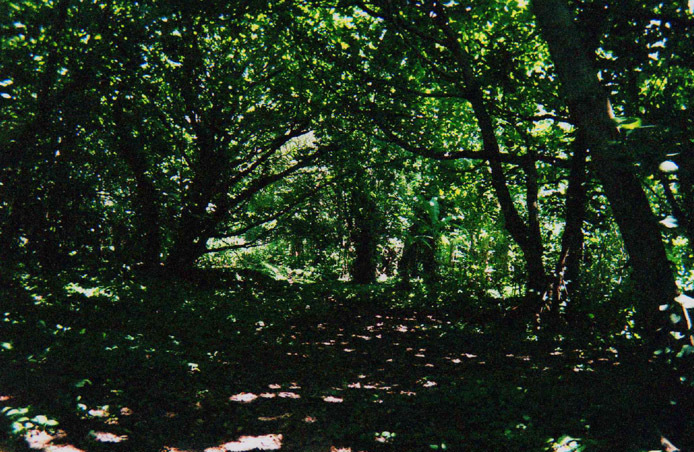 These were not like Orbs which are perfectly round, transparent and often have forms, faces or patterns within them. These lights were solid white, egg-shaped and not transparent. Then we saw a pale red one, the same size with the same behavior. Perhaps they were 'probes' that were gathering information from the area and the people who were visiting. I really don't know what they were. 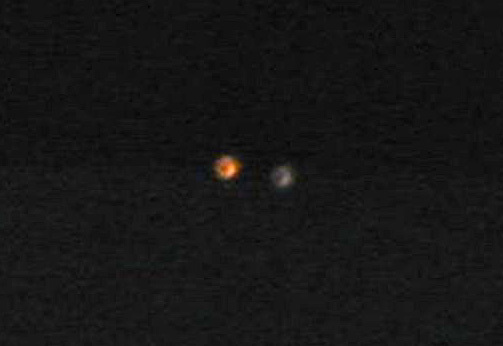 We had seen many Orbs in the digital pictures we were taking around the fire, but these were something else and seemed related to the presence of the Sasquatch. I have to add here that we also were witnessing many UFOs in the sky that would stop in place, dock with other circular vehicles and then depart at great speeds. Later when I asked the Sasquatch Medicine Woman about the white, egg-shaped lights, she told me they were Dream Walkers. I have yet to learn what that is. My friend and I were fascinated by these eggs of light. Eventually they disappeared and I was again focused on the beautiful, jewel-like embers remaining in the fire pit. Mike was sitting to my right and a little behind me, when I looked up and saw another ball of Light. This one was much larger, perfectly round and close to me. When I turned to point it out to him, there was no one sitting next to me. I then realized that this light must be the big Halogen Floodlight that had been in the cabin, and my friend must be using it to find his way around in the woods. He must have walked away without my hearing him. I thought he probably was searching for a private place to relieve himself and so I looked away to give him his privacy - although everything was black outside and I could see nothing but this bright globe. For some reason, it didn't occur to me that this large, light also had no flashlight type beam coming out of it. Out of the corner of my eye I would see this light coming very close to me. It was odd in that there was no sound of someone walking. But my friend was nowhere in sight and there were no lights in the cabin and so I was sure it must be him. The interesting part about this, is that, having made that deduction, I felt no fear or uneasiness. This became fascinating to me later as a lesson in how our minds can create fear or not. I watched the Light for 20 minutes while it moved close and further away from me. Then eventually it disappeared and I didn't see which way it went. After that I saw my friend with his old flashlight that was very dim, the batteries nearly defunct, making his way over to me. I asked him why he had gone back to using this old flashlight. (I could see that he was stumbling in the dark without enough light.) He told me this was the only flashlight he had. That answer didn't make sense to me and so I began to question him about the big light he had just been using. Well, as you can guess, he didn't even know about the big halogen light in the cabin. He had never noticed it there and he had not been using it. He had gone for a walk to enjoy smoking a cigarette without exposing me to the smoke. Suddenly I had to face the realization that the large white ball of light I had just experienced, was Not a Halogen Lamp as I thought. This meant that I had been sitting outside in the dark, all alone, with a big white ball bouncing around nearby and I hadn't shown any fear. I think I might have passed some type of initiation that night, without even knowing it! These photos are made by my computer to demonstrate this experience, since I did not have a camera with me at night. The Sasquatch still prefer not to be photographed and I respect their wishes. In the morning I drove a few miles to a house that was being built by the closest neighbors. I wanted to see if they had been wandering around in the woods last night with a big beam light. It took me a while to ask them about it since I hadn't ever met them before. We had a nice conversation and when I finally asked the question, they said no, they would not be walking around in the woods at night. I truthfully told them what I had seen and they immediately said it was Bigfoot! 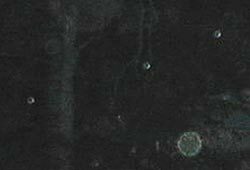 They had occasionally seen the lights themselves and, they confided, they are not sure if it is Bigfoot or the extraterrestrials who create those lights. They then went on to tell me that they often hear sounds of a generator coming from underground and also a metallic sound that reminds them of a large door slowly opening and then closing again. They are really interested in 'Bigfoot' and that is why they are building a house in this location! That night, and every night, there were many Orbs around the fire as well. 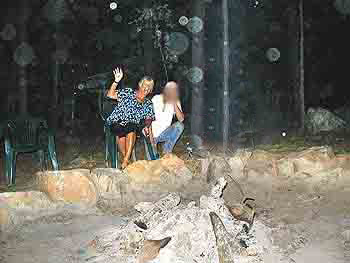 The Orb photos on this page, are the real thing, and although it looks as if I am pointing at the Orbs in the photos, I actually did not see them until the pictures were developed. Wow! I get another Star for seeing things I don't know I am seeing! 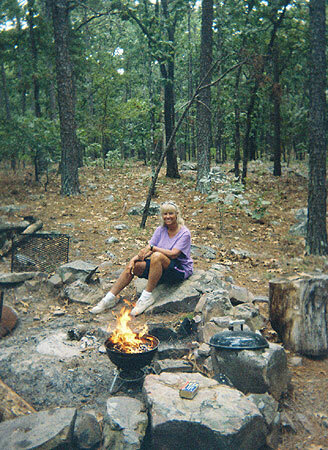 The next morning, my friends from the Archeological Society were up and having brea kfast around the fire. It was a beautiful sunny day, cloudless and clear. We were all in good spirits and talking about the events of last night, seen and unseen. We were talking about the ability of the Sasquatch to materialize things. 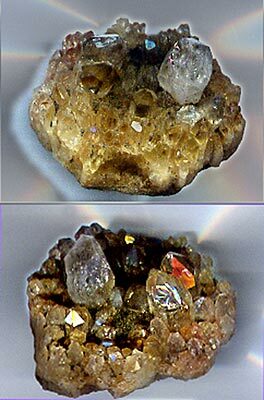 For example, our friends, Mike and Susan have found objects such as gemstones placed mysteriously in their house although the doors of their house were locked. They have received many notes and fascinating messages from the Wise Ones written on paper and appearing in their bedroom when they are asleep. Arrowheads have been teleported to them. 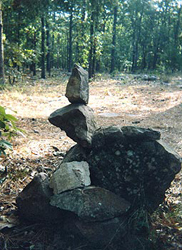 And often rocks are moved, rearranged, revealing messages, when no one is there besides themselves. Mike has even had feathers appear in his hatband while wearing his hat ! There are countless undisputable instances of teleportation by the Wise Ones. Teleportation is the transportation of matter through space by converting it into energy and then reconverting it into matter again at its final destination. How else could it have arrived there? Unless they are able to be invisible and also walk through walls to place things indoors and in hats, etc just for the fun of confounding us. Perhaps something can happen in our environment, on a vibrational level. 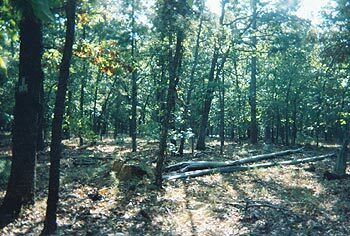 A shift, that causes a slow down of time in which a Sasquatch can walk up, place something on us or near us and leave again, without our being able to perceive him or her. Trying to understand these things, led to my new Archeological friends sharing their fascinating stories of the site they were excavating. At night, during their dreams states they were receiving communication from the spirits of the ancient cultures who once (perhaps still) lived there. The First Nation people from the past were communicating information about the dig to one of the women and they were able to find the artifacts they were seeking, by digging straight away in the correct places. This particular tribe of ancient ones were a mighty nation of people who completed their cycle on Earth by dimensional shifting en masse while fully dressed in their colorful regalia: robes of gold, magenta and royal blues. They disappeared from sight all at once, leaving little trace of their lives. Before the group left for their journey home, we joined together in meditation at the portal of the Wise Ones to strengthen the strong bond of friendship that had grown between us. It was a synchronistic meeting, bringing us together, to share and learn and expand our worlds. The picture on the right shows a location the Wise Ones designated as a vortex for time travel. The chair was placed there so we can sit at this portal to meditate and communicate with them. 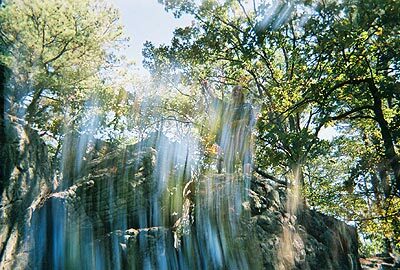 Because of all the anomalous phenomena occurring, with things appearing and disappearing, I felt myself in an altered state most of the time. Saturday night staying in a cabin at a campground I didn't sleep much. I tossed and turned -- surprisingly since I had such a full day of hiking and climbing rocks. I was in and out of sleep. Later Medicine Woman would tell me that we were Dream Walking together that night. When it was still dark around 4:00 a.m., I was fully awakened by a piercing sound in the cabin that touched my memory and caused me to sit up suddenly in bed to focus and listen. A feeling of gladness came over me, as I recognized the familiar call of the Sasquatch. I was very happy to hear them, since I really didn't know if they would come to this populated campsite even if they did leave me gifts of a beautiful white shell and a live box turtle yesterday. The sounds are somewhat like owls, but with many vocal variations that owls cannot make. I heard the hooting and then the human-sounding voices that complete the sequence of sounds. I knew them immediately from our time together last October. I was filled with Joy. I got up and put on a warm jacket. Grabbed a quilt for additional warmth and called to my friend Jack who had accompanied me this time. "Jack, are you awake?" He mumbled something sleepily from the loft. "The Sasquatch are here," I tell him. I go outside into the night and let Jack decide for himself if he wants to join me. As I sit on the porch, the unique calls of my hominoid friends continue. I feel unaccountable love for them and their amazing ability to find us wherever we are. My eyes strain to see them in the darkness. They begin projecting their calls -- certainly aware of my presence on the porch. Their sounds come from the right side of me, from the left and then behind me in quick succession -- faster than they could move to those places. Are there many of them? Or is it one or two projecting their voices all around me? Jack comes out and sits next to me on the porch bench. He hears them too and is filled with wonder. We remain silently sitting and listening. I communicate my love and appreciation to them. I am glad to have Jack as a witness and friend to share this experience with me. He is in awe since he doesn't think he can communicate with Guides or other advanced beings. He has never had any sightings or messages. This is a first for him and this time his feelings of other-worldliness that he sometimes experiences are grounded in this earthbound reality. He hears and feels the Sasquatch nearby. Sitting bundled up to counteract the early morning coolness, we remain there for an hour until the sounds slowly start to move further away. As the Sasquatch leave the area, the calls become more distant. Now out of nowhere we are surrounded by swooping, cawing crows! We have not seen them here before. The air is filled with their raucous sounds and flapping wings as we watch the show under the little roof of the porch. The crows dart through the tall spindly pine trees, noisy and demanding making us laugh. They are the messengers of Medicine Woman's family. She has told me the Wise Ones can become the spirit of the crows, traveling and seeing the world through crow's eyes. It is another welcoming message from our friends and I feel a sense of contentment that we have opened our contact again in these endless mountain ranges. After a while, all becomes quiet and I go back to bed. Tonight was about our saying Hello to each other and receiving their blessings. That is what it felt like to me and certainly to Jack too, who is very moved by this unusual experience. 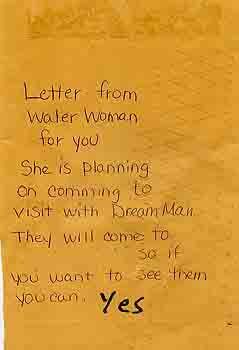 Later in the day, when I phone my friend Susan who lives there and communicates with the Sasquatch regularly, she tells me that Medicine Woman wrote her a note saying, "We see Water Woman in Dream Walk last night." I share with Susan my experiences of tossing and turning, in and out of light sleep all night, and the sounds of Medicine Woman's family this morning. However, I have no memory of Dream Walking with her during the night. This evening Jack and I go to the meeting place with Medicine Woman's family. 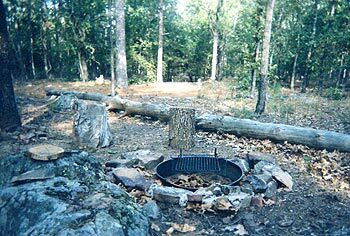 While it is still light, we bring food and cook dinner over the fire.... Then we get ready for our evening vigil, sending out our invitation to the Sasquatch as the woods become dark. The crows had gotten into a small bag of garbage tied neatly on the picnic table. There were pieces of paper and scraps all over the ground. Susan had left a sandwich (ham and cheese) for Medicine Woman when we had lunch there yesterday. She had asked me to check if Medicine Woman had come by to eat it. If not would I please throw it away since it had not been refrigerated. Looking at the picnic table I see the paper plate with the aluminum foil covering the sandwich. It looks untouched. The crows would have pecked right through the foil. I pick it up to discard it. It is very light. I open the foil and the sandwich is gone. Medicine Woman or her family was there and they ate the sandwich, and then replaced the foil on the plate. They are very neat. I know they are watching us. They know where we are and what our intentions are. They only eat the food that is put out for them, whether it is in the cabin or on the picnic table outside. Jack and I sit quietly by the burning embers of the fire. It makes very little light. That is the way I like it. All is dark by 8:30 pm. We sink into quietness and soon begin to hear the high-pitched shrieking sounds like a female trying to sing some high notes in an opera. It is a wailing and piercing sound like nothing in the animal world. There are spaces between the sounds and then the Sasquatch sounds start up again. Followed by periods of total silence, with only the sounds of dogs barking in the distance. Jack and I look at each other, wordlessly acknowledging the calls. There are so many stars appearing. We watch as one after another they light up, brightening the dark sky. An occasional plane, high above goes blinking by followed by its sound. It is peaceful. The moon is not over the horizon as yet. At 9:30 pm I speak aloud to Medicine Woman telling her we are here with openhearted love. Jack nods his head in agreement. We would like to learn from her and her family. "I know you can voice-project, do you bi-locate as well? Although I heard that you were going fishing with Beavertail at Blue River can you make your presence known to us? Or give us a sign that acknowledges our presence --- yours and mine?" Fifteen seconds pass, and as I look to my right, I see our car parked off the road in the woods. The inside lights, 3 or 4 of them, suddenly all turn on! Jack is sitting on my left. "Jack look! Look at the car!" He is amazed. We stare at the car for a while. We cannot see anyone there. Then Jack jumps up to fix it. He tries all of the switches in the car, nothing turns them off. Will it cause the battery to run down? After 15 minutes Jack turns off the back lights (later he tells me he unscrewed the bulbs.) He starts up the car, he plays with the headlights, and he lies on the floor trying to see under the dashboard. Finally he gives up on the forward floor lights and the map light. Nothing will turn them off. He comes back to sit down at the firepit and says, "If they turned them on, they know how to turn them off too." I agree. A few seconds later the lights in the car go out as we watch from a distance..... Oh well. Soon we are feeling tired and go to our sleeping bags in the blue cabin at 10:30 pm. Although tired, I cannot sleep. I toss and turn in my jeans and shirt. I remember that this restlessness happened Saturday night when Medicine Woman took me Dream Walking. If this happens again, I am determined to remember it. I set that condition that I will remember. I relax and sense the presence of the Wise Ones. I rise up to stand next to them. There are three of them. We walk, float, and appear, at a place outside. As we stand together wordlessly, a gentle breeze stirs, whirling around our feet and legs. It then increases to include our entire body. Soon we are hidden in the spiraling vortex. Next I am with them in a circular room (the thought of a Space Vehicle comes to mind.) There are 25 - 30 gentle-eyed Sasquatch there. They are convening with me to discuss our common goals. It is about how we can work together. We have common goals of introducing people to the Sasquatch families for the good of all. They share many ideas with me. Susan comes to visit and I tell her about the car lights turning on last night and my Dream Walking experiences. As I wonder if Medicine Woman is available to meet us, she reminds me that I don't have to only call on Medicine Woman. There are MANY Wise Ones living in these mountains. I can make friends with some of the others as well. She mentions different Sasquatch family names that she knows through Medicine Woman (including the white man, Jerry's mate - Sally and including the "old woman" who is called Dee.) Medicine Woman once stayed with Dee to take care of her for 2 weeks when she had blood in her lungs. I realize Susan's words that many Sasquatch live here, is a good reminder for me. Last year Pushoma gave me a beautiful ivory Dream Bird and I have not contacted him consciously since. I have always felt close to Medicine Woman and I trust her love. So I tend to speak with her. With that in mind, Jack and I drive to the blue cabin to relax, watch the sun set, cool off and sit in the dark with whichever of the Sasquatch choose to come. As the sun goes down at 7:45 pm, the mosquitoes come out and I put away my book and sit by the fire to let the smoke keep them away. It is so peaceful here -- not a sound but an occasional distant dog. We wait for the darkness to surround us, enjoying the fire. The stars are joining us in great numbers overhead. After a deep silence, I begin to speak aloud knowing we are being observed. I mention that Susan told me there are many Wise Ones living here in these mountains and that I can contact others besides Medicine Woman. I mention Tishoma and his family. Then I speak to Pushoma who is the leader in residence here. I acknowledge his gentle leadership and his wisdom. I thank him for his gift to me of the ivory carved Dream Bird. I out picture the joy and spiritual wonder it has brought me and my friends in Hawaii. It touches our hearts and our minds. I speak to the many families of Sasquatch who make these mountains their home. Then on behalf of Jack and I, we invite them to join us at the firepit. We would like to meet them. I hear the subtle crackle of a twig. I feel they are standing by in the darkness, listening. I out picture my friendship with the dolphins showing them an image of myself swimming eye to eye, in the ocean, and feeling the love we share between our species. I sense a message coming back saying: "These dolphins are small, they are your own size and so they do not frighten you. They have been promoted as a friendly species as compared to the Sasquatch Nations." So now I send them the picture of myself swimming alongside the 50 foot Humpback whales -- a strange looking race and yet so gentle. They see that I am not afraid of these oceanic giants. I welcome the Sasquatch into my life. They know that my intentions, as with the dolphins, is to befriend them myself and then when appropriate, bring other gentle souls to meet them. I sense them inquiring about Jack. Jack has been quietly listening to my words to the Sasquatch people and nodding his head in agreement. Now I address him directly. "Jack, they understand you would like to have contact and they want to know why." Jack, not expecting to be called on clears his voice, says a few a-a-a's and then sitting in his customary way with arms extended, palms out, he explains he is seeking to evolve mentally, physically, emotionally and spiritually. He would appreciate their guidance with this. He asks how he can help them. He speaks gently and lovingly. We are all in an altered state of deep inter-species communication. The Wise Ones seems content with this answer as they read the timbre and sincerity of Jack's voice. Then quietness follows. We hear a clanging metal sound. Both Jack and I listen intently to identify it. It is out of place in the forest. It is nearby. I realize what it is and whisper to Jack, "It is the barrel corn feeder hanging from the tree." (Mike, the owner of this acreage, hung it there a few weeks ago and he refills it with corn whenever he is at the cabin.) The dark green barrel is designed with a rolling yellow ball at the bottom as it hangs suspended from a tree branch. Filling the barrel from the top, the ball prevents all the corn from falling out at once. As the deer (and Sasquatch) move the ball, corn falls out in small increments. Mike showed it to me on Saturday. It was a new addition on his land. He said the Sasquatch were impatient with the yellow ball thing and managed to pull it completely out of the bottom of the barrel, so they could get all the corn at once. He said they left the yellow ball on the picnic table for him -- about 200 yards away (so he knew it hadn't just fallen out on its own!) Mike could not replace the ball in the opening and so he found a thick stunted tree branch to put there instead so he could continue to use it as a corn feeder. He buys giant bags of corn at the feed store and stores them in the Cabin to give to the Sasquatch over time. It is interesting that the Sasquatch do not touch these bags although they have full access to his cabin. He doesn't lock the door and in any case they can dematerialize right through walls when they want to. The Wise Ones only take what Mike and Susan give to them. Now Jack nods in agreement as to the source of the noise, as we hear the barrel being knocked around and hitting the tree trunk as it swings from it's rope. It is mostly empty and hollow so the knocking of the feeder is noisy near us in the quiet night. It is too dark to see anything. We have flashlights on our lap, but we understand not to use them. I wonder if some of them are wishing we had filled the feeder as Mike does. Are they telling me to bring them corn? Out of my memory, I recall that Native American people exchange and receive corn kernels and corn meal as a sign of friendship and peace. The Sasquatch are very aligned with the ways of the Indians. 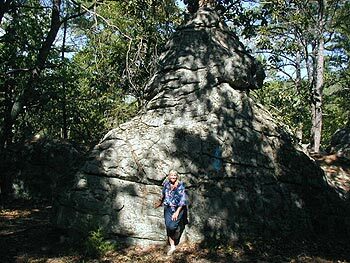 In fact they may have taught the Indians their ways since the Sasquatch preceded the Indians on this planet. Perhaps I was remiss tonight. I did not bring an offering, a gift. They are always giving beautiful stones, crystals and woodcarvings to us. 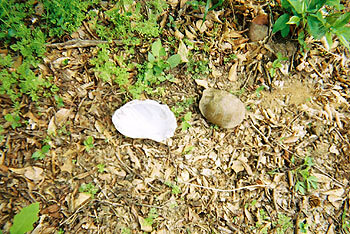 They left a gift at our campsite for us -- a large white seashell and a Box Turtle. I am still new at this and I wonder what to bring them. My friend and Sasquatch researcher gives them chocolate bars and tobacco, Susan gives them cupcakes (along with entire home-cooked dinners). Corn seems like a good idea. I wonder if I should get up and get some now from inside the cabin. I feel reluctant to move, to break the spell, as our communication is just beginning. I trust my instincts and I wait. The clanking and vocalizations continue. Their sounds are like ones made by a dog wrestling with its favorite stuffed animal. I sense it is the younger Sasquatch, not the elders, trying to open the feeder. Then quietness again. Silence --- Waiting. Then Jack and I hear footsteps in the dry leaves. They are close! We move into super-alertness. Tingling. Every sound becomes part of our bodies. The foot sounds are heavy, solid, big. Now there are more and more. They are moving toward us and then spreading out making a half circle around us. It is so dark. I strain to see them, my eyes searching for movement in the nearby trees. I cannot see them. This seems ludicrous. They are so close! Closer and closer they come, heavy, many of them, walking on the thick dry leaf mulch. Jack and I both are waiting to see if they will sit down next to us. My heart begins to race. I remind myself that Sasquatch have never hurt anyone. My mind races in different directions: What if it is not the Wise Ones but a hungry, curious bear family. They live in these woods. Today on the TV at our Camp Cabin I saw on the news that a person in Tennessee was killed and the rest of her family critically injured by a bear that the Park Rangers subsequently killed. I reason that the Sasquatch will protect us. I also sense that bears are not threatening under normal circumstances. Right then we hear a loud crash! 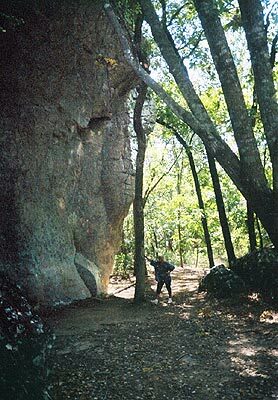 It was the sound of a big rock being thrown at a tree and bouncing off of it to the ground. A bear wouldn't do that. I understand that the Sasquatch are allaying my fears and assuring me it is them, not bears that surround us now. I am reminded of the friendship between Sasquatch and bears. It is not adversarial. I gain control of my emotions, my fears. I understand this is Class 101 from the Sasquatch ... overcoming our irrational and programmed fears, grown out of childhood beliefs, education, media and religions. Can we go beyond them? For our communication to occur with these advanced beings, we must get control of emotions, dismissing the negative, debilitating ones that freeze our minds and hearts. This is the first step for contact. I project a picture of myself and six women sitting around this fire. Waiting quietly, I now perceive a return image. It comes from the Wise Ones and it is a telepathic picture of them interspersed in the circle among us. This is what I see - the Sasquatch are sitting beside each of these women, joining our circle. My heart fills with love as I receive their message of welcome and confimation of my vision to bring people to meet them. Facing our fears is our first step. For me, this evening is an interesting exercise, a vision quest. I am feeling responsible to take care of Jack in case of an emergency. I am alone in the woods with no defenses. It is worth it to seek the truth. 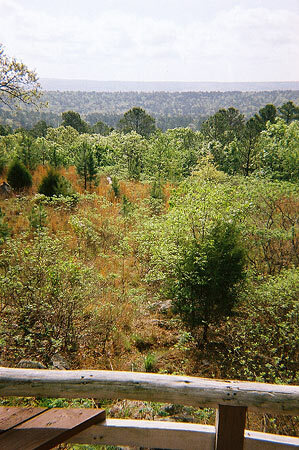 The heavy footsteps continued to shuffle around me in the dry leaves and pine needles. I look from side to side -- not seeing them because they blend with the moonless blackness. They seem to be within 10 - 15 feet of us from the sound of the loud crunching leaves nearby. In my heart I focus on my Gladness that they have come ---- that they responded to our call to meet others in the family besides Medicine Woman. It was an instantaneous response on their part and I feel deep gratitude. 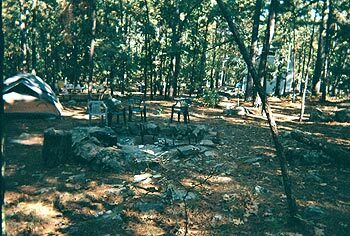 I could tell they really liked Jack too and had observed him working with rocks and rebuilding the firepit so beautifully with flat rocks on top for comfortable seating. They were communicating a name for him, but I only saw images such as Rock builder or one who loves nature, etc. I realized that the Sasquatch are aware of our presence -- and the presence of all humans in the woods. When Jack started our fire around 7 - 7:30 pm they smelled it, as did all the animals in the forest. With their keen sense of smell, they could discern between a natural forest fire and a man-made fire. (for Example: we put our left over food from yesterday into the fire - tomatoes, potatoes, macaroni salad and even the styrofoam plate. They would smell all of that and know it was humans.) For some forest residents of the animal species this fire would represent a sign to stay away, to avoid the human species. But to the Sasquatch with their curiosity and their willingness to respond to our thoughts and words, our fire welcomed them and they came close. As my fear dissolved and my Joy and Appreciation increased, we remained in a quiet circle of deep communication together. They had formed the circle I had envisioned. They were part of our fire circle, our council. After an hour I heard their footsteps retreating. I knew they were leaving. Jack and I remained there in the silence for 10 more minutes before departing for the campground and a hot shower. It was nearly ten o'clock. We knew that the meeting for that night had been completed and without words spoken, it was time to go into dreamtime and rest. Jack was completely astounded by the entire experience, since he had never had any kind of contact until this night. His eyes were as big as Saucers and appropriately so!!! 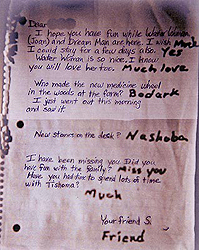 The day I left, Susan found this communication on my notepad, that I'd left in the cabin. It is from Pushoma. 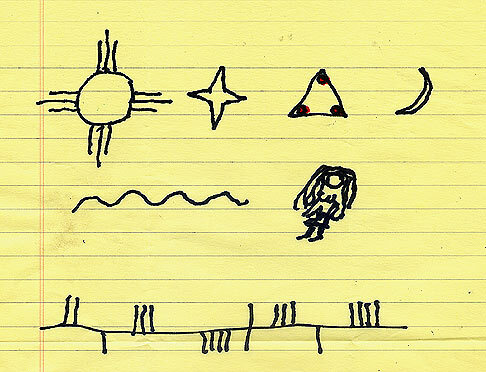 If you have any feedback about the meaning of these symbols, I would love to hear from you. Email: Joan@joanocean.com.